to see where it goes! Where do soiled napkins and paper towels (hand-drying) go? Where do paper coffee cups go? How about the plastic lid and the cup sleeve? TThe paper coffee cup goes into the Organics (green) bin. Remember to separate the plastic lid from the cup. 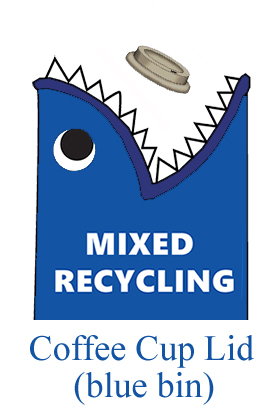 The plastic coffee cup lid and cardboard sleeve go into Mixed Recycling (blue) bin. Without separating the lid or sleeve, the coffee cup will become a contaminant in the bag of Organics waste. 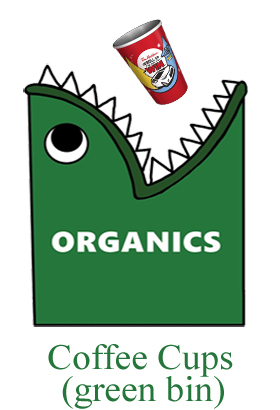 Do soft drink cups go into the Organics (green) bin? No, soft drink cups may appear to be the same material as coffee cups, but soft drink cups have a wax coating on the outside and inside of the cup. This wax coating makes it difficult to process in the organics bin. Therefore, the cup should be placed into the landfill bin, along with the straw. Can I pour my leftover liquids into the Organics (green) bin? 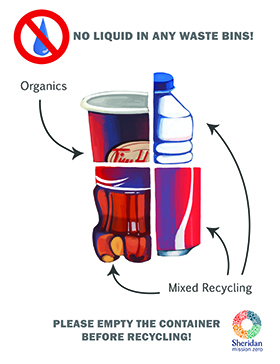 No, please do not pour remaining liquids into the organics bin. Adding liquids to the organics bin significantly increases the weight of the compostable bag, causing it to tear easily. The additional weight will also add to the hauling costs. 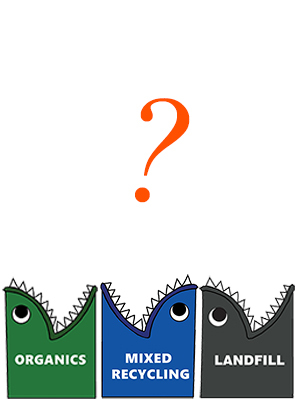 Can my paper food wrappers go into the Organics (green) bin with my food? No, most food wrappers are made from wax coated papers that cannot be processed in the organics. 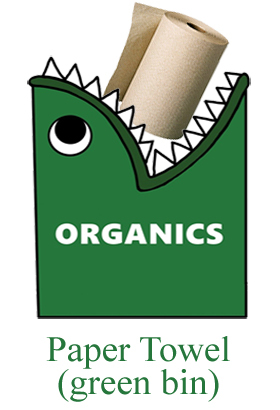 Only napkins and paper towels can be placed into the Organics (green) bin. Placing food packaging in the organics contaminates the bin. 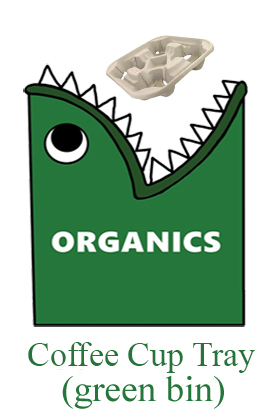 When an organics bin is significantly contaminated, all the waste collected will be sent to a landfill instead. 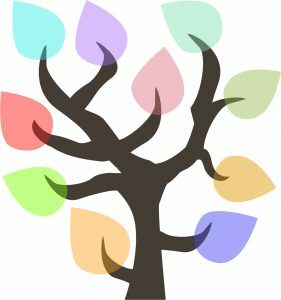 Where and how is the “Organics” waste being processed? The “Organics” waste collected in this green bin is being delivered to a power plant in Ontario where the material is processed through a process called anaerobic digestion. The material is converted to electricity and put into the grid. Fertilizers are also produced. Why is it a problem if I throw the leftover of my meal together with the recyclable packaging into a Mixed Recycling (blue) bin? 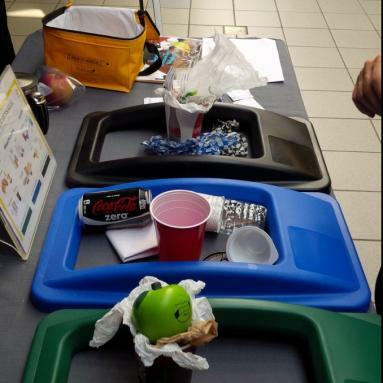 Food waste placed into the mixed recycling (blue) bin is considered contamination because it makes sorting the waste at a facility very difficult. In addition, certain items such as fine papers can become non-recyclable if they are contaminated with food. Should I throw my half-finished soft drink can into the blue bin? No, please make sure you empty the can or cup first. You can pour it down a kitchen or washroom sink. Liquid or food waste in the mixed recycling can make it difficult to recycle certain items, such as papers. Liquids also adds a significant amount of weight to the bag, making it easier to tear. Additional weight will also increase the hauling costs. Should soft drink cups go to the blue bin? No, these disposable cups should go to the Landfill (black) bin. They have a wax coating that prevents them from being recyclable. The straw should also be placed into the Landfill (black) bin. Should my paper coffee cup go into this blue bin? 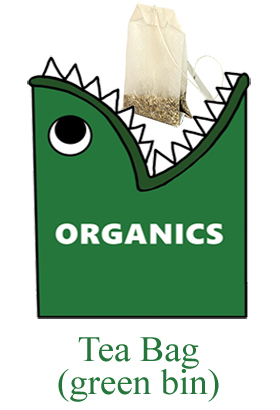 No, paper coffee cups can be processed in the Organics (green) bin. However, the lid and sleeve should go in the Mixed Recycling (blue) bin. Please remember to separate them from the coffee cup. What kind of plastics are recyclable at Sheridan? 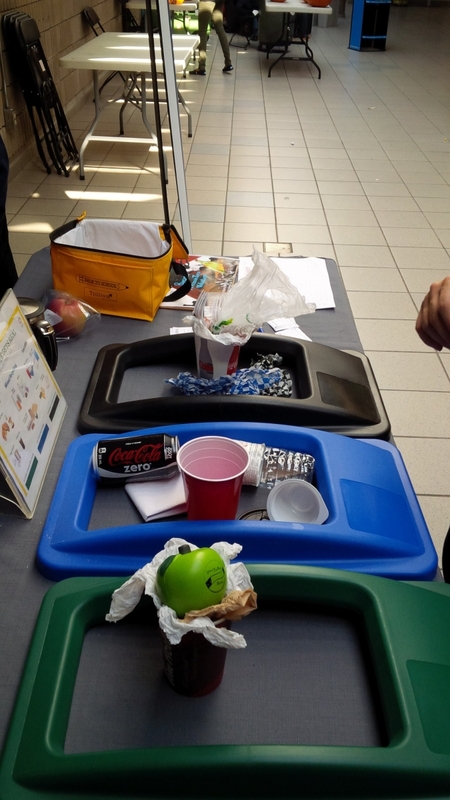 Plastics #1 through #7 are recyclable at Sheridan. Look for the number inside the recycling symbol. Can I recycle milk cartons at Sheridan? 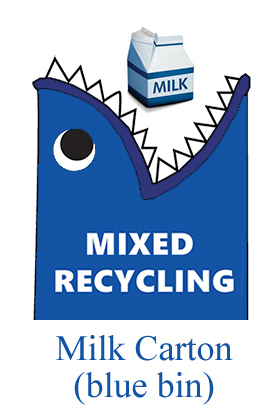 Yes, milk cartons can be placed into the Mixed Recycling (blue) bin. Styrofoam is recyclable at my house – why can’t I recycle it at Sheridan? Styrofoam is acceptable in some municipalities. Sheridan does not use the same waste facilities as municipalities. Therefore, there are some differences in acceptable recyclable items at Sheridan and at your home. Can I put plastic bags into the Mix Recycling (blue) bin? No, plastic bags must be placed into the Landfill (black) bin since they cannot be properly sorted at the recycling facility who process the waste collected from Sheridan. Can wax paper be recycled? No, wax paper must be placed into the Landfill (black) bin. Why aren’t plastic cutlery and straws recyclable? Plastic cutlery and straws are too small to be sorted at the recycling facility, so they must be placed into the Landfill (black) bin. You can reduce waste to landfill by bringing your own cutlery from home! 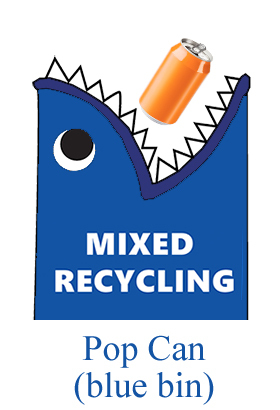 Should I put my Thai Express food container into the Mixed Recycling (blue) bin? No, Thai Express food containers, which are made of more than one material, are not acceptable for recycling. Therefore, they must be placed into the Landfill (black) bin. Should I throw a paper coffee cup into the Landfill (black) bin? No. It should go into the Organics (green) bin. Make sure you separate the plastic lid and the sleeve first, which should go to the Mixed Recycling (blue) bin instead. 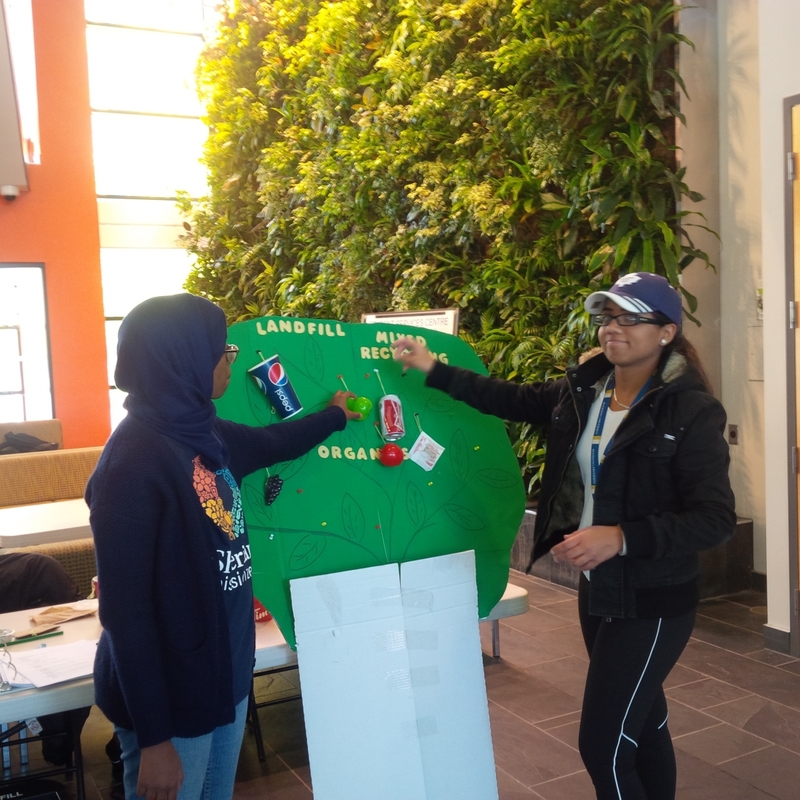 Should the soft drink cup go to the Landfill bin? 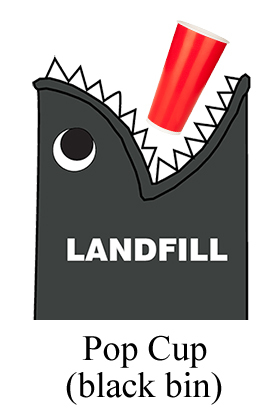 Yes, the soft drink cup, which contains wax coating, should go to the Landfill bin. If the cup is a type of clear plastic with the recycling symbol on it (e.g. Tim Horton’s iced cappuccino), it should go to the Mixed Recycling (blue) instead. The plastic straw should go to the Landfill bin. 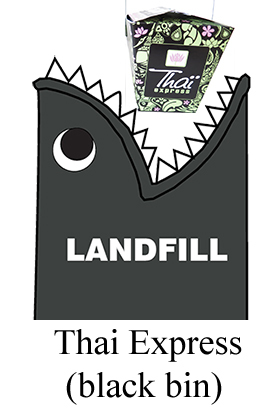 Why do Thai Express containers have to be placed into the Landfill (black) bin? Why is it a problem if I throw the leftover of my meal together with the packaging plastic bag into a landfill bin? 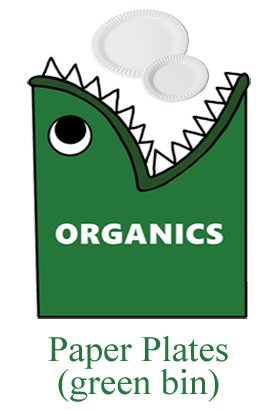 When organic material such as food waste is decomposed at a landfill, methane, is released to the atmosphere. This type of greenhouse gas is over 20 times more potent than carbon dioxide in its contribution to global warming. 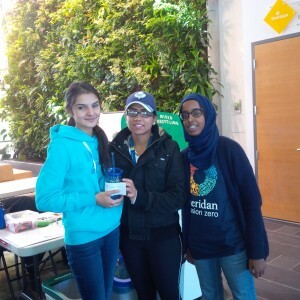 At Sheridan, organic waste is collected via the green bin at the Zero Waste station and it is delivered to a power plant where it is converted to electricity and fertilizers.